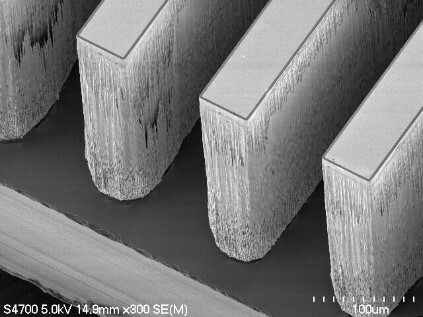 ARC has been working on small MEMS types of devices for several years based on winning several NASA and DOE SBIR’s. 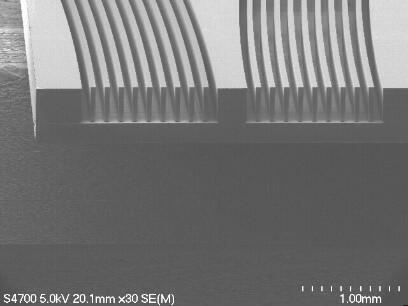 Shown below is the approximately 1.2 cm3 patented Micro Ion Spectrometer (MIS) project. The MIS is comprised of three MEMS components: the Collimator, Energy Analyzer, and Detector. The project is in cooperation with the West Virginia University and the Goddard Space Flight Center. The concept is applicable to Fusion Energy Plasma Diagnostics and Ionospheric Studies, due to its small size, it is planned to be aboard numerous micro satellites. A commercial application exists as well for plasma processing diagnostics. 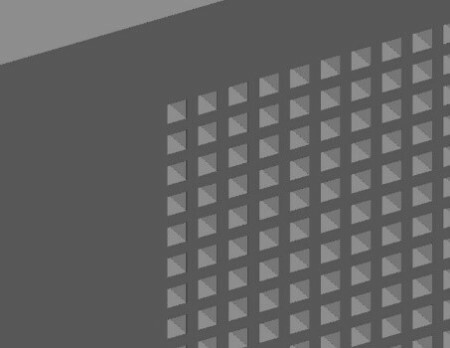 The basic concept entails using a collimation grid to align the ions impinging on the face of the Collimator (C) and guide them into the Energy Analyzer (EA). As the ions enter the EA channels with a specific curvature, across which there exists a specific potential difference, some of the ions will make it through to the detector and be counted. See Figure 1 for a drawing of the general concept, and Figure 2 for cartoon of the MIS assembly in its 25 plate embodiment. Item 1 is the Detector, item 2 is the Collimator and item 3 is the Energy Analyzer. 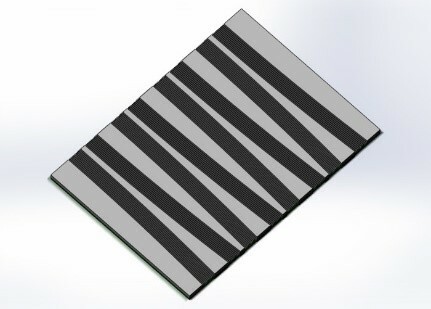 Fabrication relies on standard photolithographic techniques starting with a CAD model and then mask design files in GDS-2 Format. 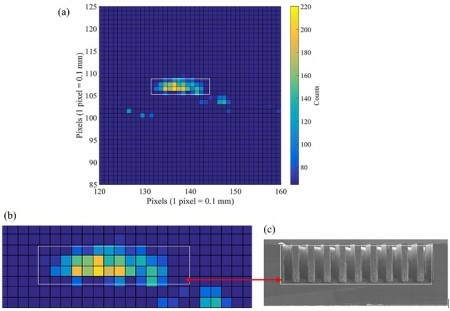 A 3D CAD drawing is shown in Figure 3 (right) and tools such as Deep Reactive Ion Etching of stock wafers to achieve the actual Collimator device shown in Figure 4 (far right). A single Energy Analyzer plate CAD drawing is shown in Figure 5 (right) with an actual EA plate shown in Figure 6. The elegant design of the EA’s curved channels with a potential distributed across the channels allows only the ions with a given energy to make their way through to the detector at the far end of the EA to be counted. Thus a single EA plate mounted in the wall of a Fusion Tokomak will suffice where the ion density is high as it is near the wall of the Tokomak and the edge of plasma. 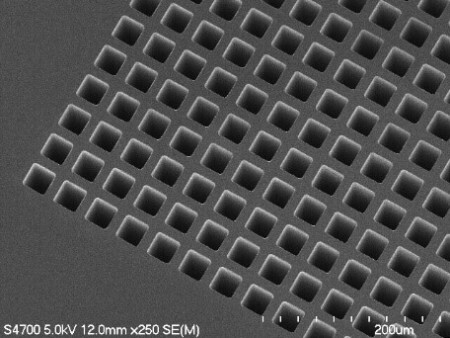 By stacking 25 plates, low ion density environments such as Space enable a sufficient number of ions to be detected and counted. The Deep RIE produces the sharp curved walls needed for the EA function, see Figure 7 (right). 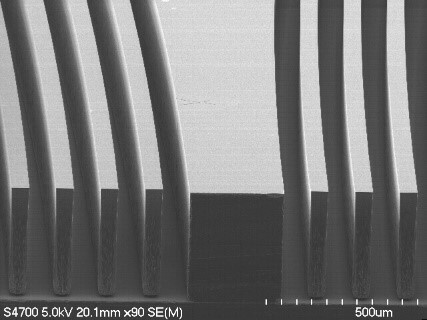 In Figure 8 (far right), a higher resolution SEM photo illustrates the gold contact metal sputtered onto the top of the channel walls for the needed voltage distribution required to differentiate the various ions under study. As discussed above the EA plates may be stacked using the ARC FC150 hybridizer with its 1um alignment accuracy. 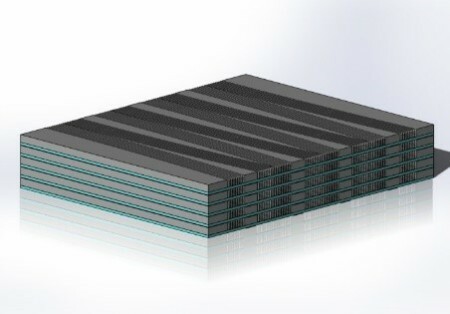 Shown in Figure 9 (right) is a CAD model of a 5-stack of EA plates. 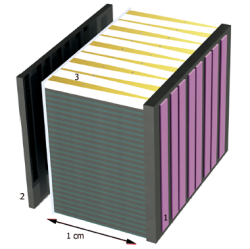 Further right in Figure 10, is an actual bonded stack of 4 Energy Analyzer plates. 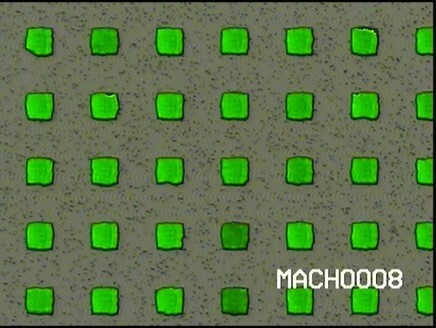 Figure 11 (left) illustrates a backlighted actual Collimator which offers an idea of the precision of the Deep Reactive Ion Etch process. 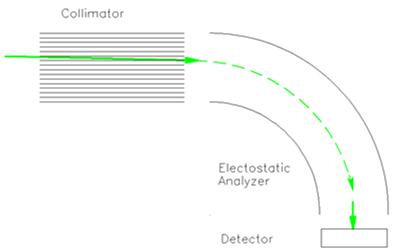 In Figure 12 (right) is a detector map showing the ion “hits” passing through the Collimator and Energy Analyzer to the Detector. In this very early test, there was an area mismatch between the Detector and that of the EA so some extraneous ions were detected. Figure 12. Goddard Space Flight Center used their ion source to direct ions at the Collimator and Energy Analyzer and using their Detector for analysis. Drawings and sketches may be submitted through our contact page. You will be contacted shortly to discuss your project.